Too often in kids’ gaming, I find that clients want to build overly complicated, sometimes convoluted story lines to help their games along. I can certainly understand the instinct to do so. The idea is to contextualize the action, to give the user a call to action and motivate gameplay. That having been said, I’m coming to the conclusion that less story, if handled nicely, can be better. 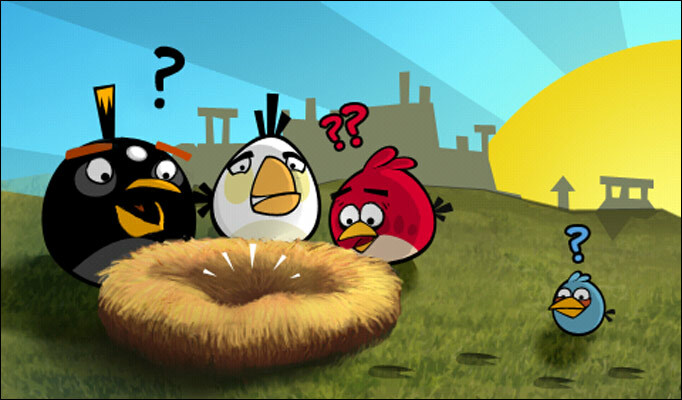 Enough has been said of the success of Angry Birds, surely. That having been noted, I think one of the real successes of the game is that the designers did an amazing job of letting the narrative inform the game, and then getting out of the way and letting the game drive. There are non-interactive sequences that set up the critical narrative elements, but they’re short, intentionally vague and simple, and avoid cluttering detail. We quickly learn that the birds are our protagonists, that the pigs are evil and stealing eggs, and that we need to clobber them. That’s kind of it. There’s no five minute animation explaining how the usually kindly birds of the planet Nestfallia have been invaded by the evil pigs of Suidae, blah blah blah. I’d like to point out that it’s not as though I don’t like the animated bits in games– I create and direct animation as part of my career. This simple approach to story telling allows the user to focus on the actual game rather than trying to decode the visuals on screen and imagine how those visual exist within the narrative of the game. Assuming that the game is intrinsically fun, with intuitive game play, making the user a complicated exposition can be an expensive hurdle.